1. Half fill a serving jug with crushed ice, pour in the Pimm’s and cherry juice drink. 2. 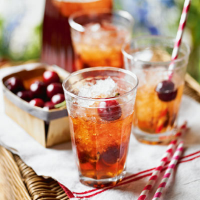 Just before serving, add the soda water (or lemonade), and pour into tall glasses, garnished with cherries.